Halloween (1978) and Halloween II (1981) edited into one 110 min movie. 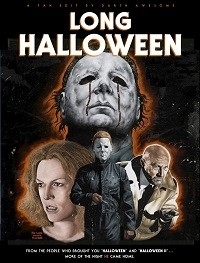 Halloween has been trimmed for pacing and Halloween II has been greatly streamlined to focus on Laurie, excluding most of the other characters and kills. There is a lot to love in Halloween II, but it reflects the shift in horror movies between 1978 and 1981, when it became all about the kills. I wanted to put the focus back on Laurie, Loomis, and Michael, reducing the gratuitous nature of the second film. My intention was to invisibly stitch Halloween and Halloween II together, keeping the tone consistent. In my parallel universe, LONG HALLOWEEN was the film released in 1978. Cut Laurie seeing trick-or-treaters, "thought you outgrew superstition"
Cut Loomis warning neighbor "you don't know what death is!" Cut all character development and death scenes for Jimmy, Budd, Mrs. Alves, Dr. Mixter, and Janet. Trimmed hospital aftermath scene. No mention of "10 dead"